In spite of its amazing natural beauty and historical abundance of marine resources, the Gulf of Maine is a highly stressed ecosystem in urgent need of attention. Hundreds of years of inadequate wastewater and stormwater infra-structure, tremendous pressures on natural resources, effects of shoreline development on coastal ecosystems, results of a changing climate, and the dumping of toxics have taken an enormous toll on the health of the environment and impaired the Gulf’s overall potential. For example, raw sewage and polluted stormwater routinely wash into coastal waters. Thousands of miles of migratory fish habitat along rivers and streams are blocked by obsolete dams and poorly engineered road crossings. Invasive species are crowding out some native species and disrupting natural cycles. Sea level rise is threatening coastal habitats and human development alike. New solutions and scientific data to address these issues are being generated constantly. However, often this information does not reach coastal decision-makers around the Gulf of Maine who could put the solutions into action. 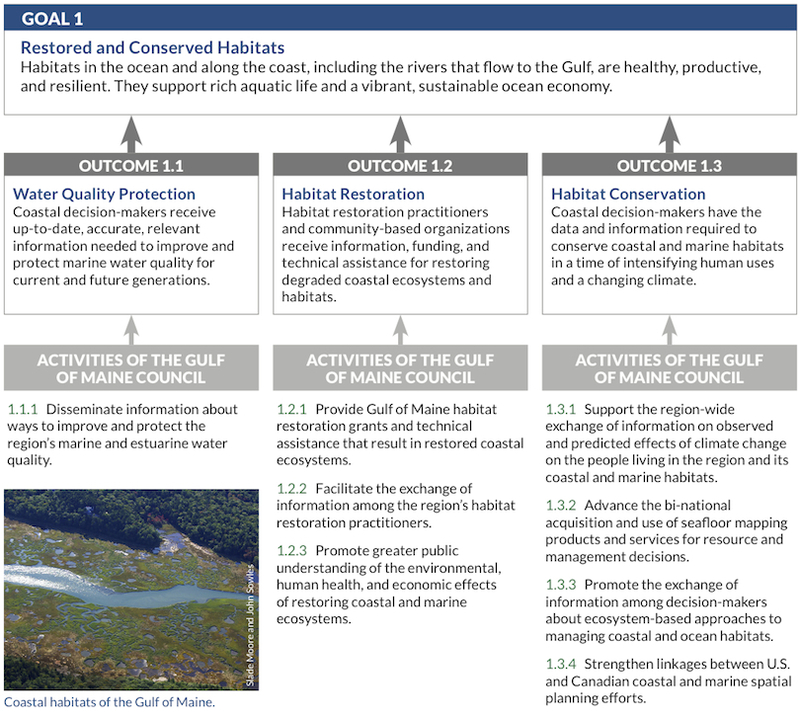 Goal 1 activities address the region’s need for data, information, and partnerships to restore and conserve marine and coastal habitats.